We spoke to Ryan McVinney, President and Founder of The Music Gym. As discussed briefly last week, The Music Gym will be opening their doors for good at some point in the near future. They are still hosting sick parties as we speak, but they are waiting for the city of Austin to get their stuff straight. See what he has to say about the making of The Music Gym and what they have in store for us. This is a real good idea, when did you come up with it? I came up with the idea in 1999-2000 while living in Manhattan. At that time I was running an hourly rehearsal studio on F.I.T. campus near Madison Square Garden with my friend Behrang, lead guitarist for the well known NYC band Goodfinger. The place was called 701 Studios, and we were charging hourly for practicing. A ton of people were coming because they couldn’t afford to rent a room. I got the idea that we should start a monthly club for them, like a “gym club”. It just made sense. I returned to Boston and started the first Music Gym (which is still open) in Boston’s Allston neighborhood, nick-named “Allston Rock City”. Me and my business partner Rob built a digital recording studio in the basement of an old circuit board building factory and had 5 music practice rooms, along with a funky art studio and lounge. We had a great community there, started a small record label (Get Nice Records), and people loved the idea so much, we decided to try and make it a chain — hoping to apply the American concept of corporate chains to a creative and co-operative type of facility and service. Another imitator learned of the idea, and began a similar company near ours, with a similar business model, calling themselves “Jamspot” (http://www.jamspot.com ). Anyways, after scouting out a few cities for a second location (including L.A., San Francisco, NYC, and others) I sold out my percentage in that location in the summer of 2006, to go on tour with my band (The Second Hand – http://www.myspace.com/thesecondhandband ) and to try to find a spot for a second location. So why did you decide to open up a location in Austin? I chose Austin because it claims to be the “Live Music Capital of the World”, and because real estate and cost of living here was cheap. We explored New York City for about a year, particularly the Williamsburg area where there are a lot of lofts and warehouses, but the cost was simply too much for us at the time. Austin had more of our type of small-business vibe, and the type of neighborhood we thought our community oriented music co-op and venue could succeed. Tons of people have told us we think it is perfect for Austin. 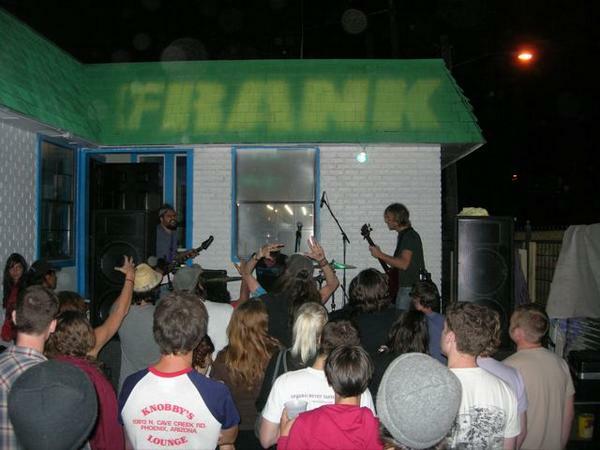 I arrived in Austin in the Fall of 2006 with my band in our mobile recording studio and RV. We lived in the RV park Shady Grove/Pecan Grove on Barton Springs for a few months, and eventually moved into a house next door to the Austin band Octopus Project. I searched the City for buildings for the second Music Gym, struggled to obtain a few, then finally found our location on 6th Street, which we purchase d in February of 2007 and have been renovating it since. We won in a bid against Avis Car Rental and Starbuck’s. The woman who owned the building was an older hippy who wanted to see a local business succeed there, and liked our idea. Also, the City of Austin rejected Starbuck’s plan for a drive-through coffee shop. Score one for the City of Austin, though they have later gone on to be a serious thorn in our side in terms of planning, permitting, zoning, and inspections! Do you feel like you have a large customer base here in Austin, the live music capital of the world? We feel we have a HUGE customer base here in Austin, both in terms of musicians to belong to the co-op, and patrons who will enjoy the performances, the outdoor patio, indoor lounge, and our eventual roof deck. We think people will enjoy the vibe here. Who do you feel is your target customer base? For musicians and co-op members, the targeted customer base is practicing musicians in and around downtown Austin who may not want to rent a monthly room in a warehouse, and who want to be a part of a community and a venue where they can perform once a month. Also, those who will appreciate having professionally maintained equipment, and access to ProTools recording stations and on-hand audio experts. We will also rent and sell music equipment to gigging musicians on 6th Street, which is sorely needed in that area. In terms of patrons, we will offer an alternative environment from the rest of the college, frat/sorority type of bars and clubs on 6th. Our environment will be more of an art studio/music hall vibe, and our planned patio and roof deck will be more akin to a place like Spider House than to a modern dance club like Pure. We think this is Austin’s natural local personality and that a lot more people would head down to 6th to hang out and listen to music at a place like this, than say, another Blind Pig. We will also hold open art shows, community classes, and movie screenings, among other events. When will it be open for use? This is up to the City, but it should be within the next 2 months. They have finally approved most of our plans. We still are seeking a parking variance for our patio build out and permanent outdoor stage, as well as a conditional hearing for a change of use for our lounge from “Indoor Entertainment” to “Cocktail Lounge”, something the City requires, but the TABC does not. Will you be having some sort of grand opening party? Definitely. In fact, we are already having parties. Tonight! Birds Burnet BFF Party! Rich Person on Eastsider: Leah! Five Things on Eastsider: Leah! john on Ink! We need ink STAT!